Rob Pitera is global product development director of manual clamps and end effectors for Destaco, Auburn Hills, MI; www.destaco.com. Nonporous materials such as steel, aluminum and hard plastic can be lifted via a lower vacuum flow, but surface conditions such as the presence of rust-inhibitor prior to stamping require research into proper vacuum-cup selection. 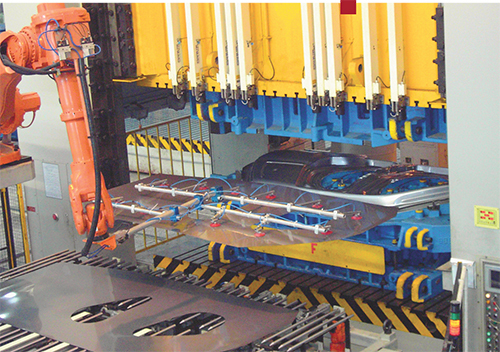 Manufacturing efficiency and reliability reached a higher level when many tasks involved in assembly and workholding processes began to be automated. This refinement has continued to a level where, today, most manufacturers rely on highly technical computer-controlled and -monitored systems that utilize robots to perform tasks once completed by human hands. Many of these computer-controlled and robot-reliant systems would be nothing more than inanimate erector sets if not for what appears at the end of computerized arms: the humble vacuum cup. Often an afterthought during design of automated workholding systems, vacuum cups play a significant role as the components that actually make contact with the sheet or part to be grasped and passed along. Here we’ll highlight the importance of vacuum cups in manufacturing automation systems, and illustrate the unique operational characteristics and parameters to be considered and satisfied in order to choose the ideal cup for a specific task. That’s right…vacuum cups are not suction cups. Suction cups operate through the use of downward pressure onto an object, which creates a seal as the air under the cup is expelled. Admittedly, this action does create a vacuum that allows the suction cup to stick to an object. But, what differentiates the vacuum cup from the suction cup is the vacuum cup’s use of a pneumatic vacuum generator with a venturi, which creates compressed air that produces the vacuum. The vacuum generator draws the air out of the cup, which lowers the air pressure inside of the cup below that of the surrounding atmosphere. The greater atmospheric pressure pushes the object onto the vacuum cup and allows it to be lifted. The lower the pressure inside of the cup (i.e., the higher the vacuum), the greater the lifting force of the vacuum cup. When the object reaches its new position, the air supply to the venturi is cut off and vacuum generation ceases, which allows an object’s release. A variety of cup shapes, materials and hardness levels serve a variety of applications. Typical vacuum generators allow delivery of about 60 psi of compressed air to the venturi via flexible, polyurethane air lines. Operators must ensure that the air lines remain free of moisture and debris as any airborne contaminants can clog the venturi and cause it to malfunction. Material types generally fall into one of two categories: porous or nonporous. Porous materials include cardboard, wood and Styrofoam, all of which generally require higher vacuum flow, but don’t necessarily require high-level vacuum generation in order to be lifted. Nonporous materials such as steel, aluminum and hard plastic can be lifted via a lower vacuum flow. Surface types also fall into two categories: dry or oily. Most objects to be lifted are dry, but some materials may feature a fine oil on the surface. Sheetmetal treated with rust inhibitors prior to stamping can leave an oily sheen. As for contour, cup selection depends on whether the material is flat, or has curves or rounded edges. In some cases, where an object contains too many curves or undulations, a vacuum cup will not work. Also, objects with too many closely spaced holes are not compatible with vacuum cups. Cups with certain characteristics perform more ably when tasked with gripping contoured surfaces. Users traditionally have chosen from two vacuum-cup shapes: round or oval. 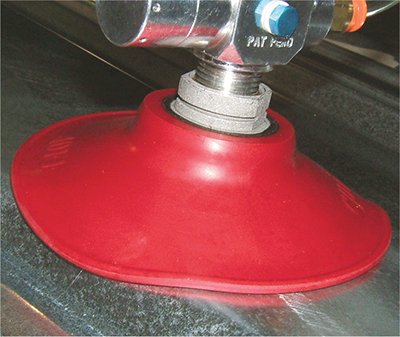 Round vacuum cups represent the default style, but should an operation require grabbing of a thin rail around a car-door window, for example, a long, oval vacuum cup may be needed. However, bell-shaped vacuum cups have grown in popularity. The main design advantage here: The bell-shaped vacuum cup’s body adheres easily to convex or concave surfaces through a refined internal friction, or tread, pattern built to withstand high shear forces. Vacuum-cup families include two general design types: flat or bellows-style. A bellows-style vacuum cup resembles an accordion, making it more flexible and allowing for grasping of items without consistent shapes, or not well-aligned with the cup. In these instances, though, a higher vacuum flow is needed to remove the larger volume of air inside the vacuum cup. Flat vacuum cups require a lower volume of air to be evacuated, but these are not as pliable as their bellows-style cousins. 30—soft, ideal for use with contoured panels. A cup with this measure, however, exhibit a shorter lifecycle than a harder cup. 45—a medium-hard rubber that effectively seals and adapt to most contours, making it ideal for all-around usage. Such a cup generally has a longer operational life than a 30-durometer cup. 60—the hardest durometer measure, and a cup with this measure is effective for extremely oily, flat surfaces. It features a longer service life than a 45-durometer cup. Some vacuum-cup suppliers color-code their products by durometer for simple identification, maintenance and replacement. When choosing a durometer for the application, remember that contoured parts, or those with sharp corners or edges, need a softer durometer so that the vacuum cups can easily grip the contours. Flat surfaces are ideal for harder durometers because the vacuum cup has stronger holding properties. Like the manufacturers of vehicle tires, all vacuum-cup suppliers have created their own unique tread pattern. The design of the tread pattern determines the holding power or grip of the vacuum cup on the surface of a part or sheet. What works in one application may not work in another, especially if a material surface is dry or oily. Some vacuum cups combine their unique treads with a range of durometers to help increase grip strength. A wide range of mounting types is available to manufacturers, including male/female, imperial NPT and metric-G threads, square T-mount, and quick-disconnect. New lightweight-plastic thread mounts also are available. Before choosing a mounting type, check on the type of automation system in use. If the vacuum cup can’t be placed on the mount, the system won’t operate. If necessary, perform onsite tests to determine the right vacuum cup for an application. For example, while your first thought may have been that two large vacuum cups should work for an application, A test may show that six smaller vacuum cups perform more satisfactorily. Beyond the type of material, consider the weight and size of the object to be lifted. A light sheetmetal automotive hood features an easy-to-grip flat surface, and while a single vacuum cup could accommodate the hood’s weight, something that large can fall out of balance when moved, causing a drop. In this case, using four or more vacuum cups can balance the load, thus further securing the transfer process. Also, the importance of vacuum-cup size, tread pattern and durometer in high-speed, pick-and-place transfer applications cannot be stressed enough. The vacuum cup must grasp the panel during the most stressful points of the automation’s acceleration and deceleration phases—each and every time.